The first thing Sam told me this morning was, "Mommy, I dreamed we got our Christmas tree last night." So off we went today to get our Christmas tree, and what a happy boy Sam was. At one point, when I carried the tree into the house, he was jumping up and down in excitement. Although I appreciate designer trees, our tree is an eclectic assortment of ornaments and decorations that we've made or have been given by friends and family over the years. Since all the ornaments on our tree represent something or someone special, I have grown fond of the mismatched look over the years. And this year was the first that Sam was a willing and enthusiastic participant in decorating the tree. Last year, he may have been more interested if he hadn't been adjusting to his new sister, who was born a few days before we got our Christmas tree. I let him stay up tonight later than usual to help me finish decorating it. Fortunately, while all the decorations were out, Landon and Juniper were away as Landon had a practice for an upcoming gig, and he wanted to take Juniper along, so it all worked out perfectly. When Sam saw the green and yellow hand print, he excitedly asked, "Mommy, is this MINE, just like the one you made for Juni?" Of course, it is Sam's, from his first Christmas, when he was ten months old. Juniper has a hand and foot print just like I made for Sam that I still need to paint so we can hang them on the tree. Sam and I are also going to string up some cranberries for garland this weekend. But here's what the tree looks like so far, and Sam put most of the ornaments on the branches, using a chair to reach the high ones. I'm still not quite satisfied with the arrangement of the lights, but I know Juniper and Sam will be tugging on them quite a lot in the coming weeks, so I decided to leave them alone. Plus, it's really only fun to decorate the tree the first time, and I didn't want it to become a tedious task. I've been putting the mauve and white ribbons on my Christmas tree for more than a decade now. My Mom is very much a fan of all things Victorian, and when I was little, I helped her make all those ribbons by hand for her tree, and she had matching mauve and white Victorian bulbs to go along with them. Later, she passed along some of her Christmas decorations to me when I was poor and living in a studio apartment, and those ribbons got thrown into the box. They, like everything on our tree, have sentimental value, so even though they aren't really my style, I can't help but love them just the same. Just like I love this little hand print, which will always remind me of the Christmas of 2005, when Sam was a chubby little 10 month old, taking his first steps and making the only sound he knew, "D," every time we passed a digger on the road. Tonight was a special evening spent with my little three-year old boy, whose excitement over each ornament, the Christmas lights, and our tree is a memory I hope I will always have of Christmas, 2008. 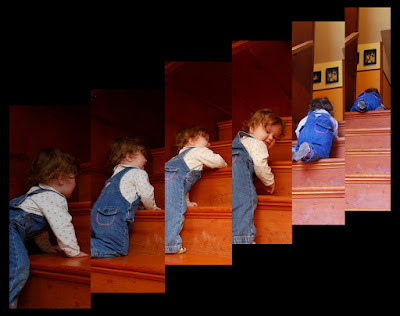 Along with this memory--of Juniper proudly climbing the stairs, which Landon captured so nicely last night. She climbed the stairs to the top for the first time on December 3rd, climbed them halfway up on December 2nd, and said "ho" with the soft 'o' today, December 4th, for "hot" and tried to blow on her macaroni and cheese. She's the sweetest little girl ever. I love this post. It reminds me so much of our Christmas's. I was just telling a friend the other day that our tree is already such a random assortment of ornaments, and we've only been married three years. But, I love it, and would also rather have my tree decorated with ornaments that mean something to me than beautiful ones with no meaning. That said, your house looks beautiful! I have been meaning to tell you how much I love the look of the wood on you walls and the wooden window frames and grids. Gorgeous. One last thing -- the comment about your mom loving all things Victorian made me laugh. I can see her Victorian decorations even now! When she took us to the mansions of field trips, her favorite ones were always the ones with Victorian leanings! Oh!!! How nice of you to say that about your dear old Mom, Honey!!! How funny Kelli said that~~~it really made me flash back to times of old that were very special times!!!! Love, love, love the Juniper - climbing the stair thing!!! Tell Landon that he did a great job!!! Your house looks very nice and I wish I could of heard a tape hearing the excitement from Samuel!! The tree is beautiful Karli! I love the little ornaments from the previous years.... and I love even more how the kids love them. Cute cute cute pic of Juniper and the stairs! She's getting so big!